PHUKET CITY: The People’s Alliance for Democracy (PAD) spokesperson for Phuket has commended the local “red shirt” group for its commitment not to disrupt the upcoming Asean-led summit meetings in June, but vowed to mobilize PAD members to prevent any incursion onto the island by red shirt protesters from other parts of the country. Miss Aparat was speaking in reference to a press conference held yesterday by Wisut “Ae Inside” Tangwittayaporn, who heads the “Phuket Protect Democratic Group”, an affiliate of the National United Front for Democracy Against Dictatorship (UDD) who remain loyal to former Prime Minister Thaksin Shinawatra. For details of the press conference click here. However, Ms Aparat said she had heard from “informed sources” that Prompong Nopparit, spokesman for the pro-Thaksin Puea Thai Party, is planning to mobilize as many as one million red shirt protesters from Isarn and other parts of the country to assemble in Phang Nga during the summit. “If the Phuket red shirts are really committed to saving our economy, we ask them to help stop this from happening,” she said. 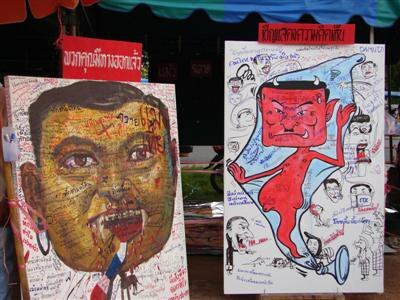 “The yellow shirts would like everyone to understand that we cannot destroy Thailand anymore. This government is faced with a financial crisis and we must put solving it as our first priority. Local and national level politicians must put the needs of the country before their own political aspirations,” she said. “The yellow shirts will not give any chance for red shirts to come near the area where the Asean summit is being held. We have a plan to block the red shirts,” she said.